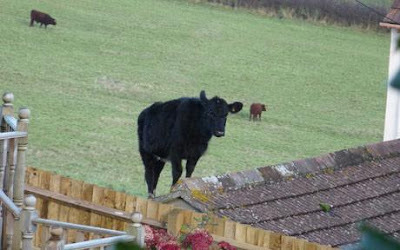 Cow jumps on a roof---Is the moon next? The house owner in Blagdon, Somerset, called police after getting home to find her roof seriously damaged and smashed tiles as she feared a burglar had tried to break in. Local PC Ray Bradley said: "This was initially recorded on my figures as a burglary so I am glad I can take it off. "If it wasn't for the door-to-door enquires and this photo we wouldn't have found out it was a cow responsible."